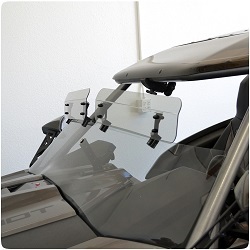 Quick and easy install requires no drilling, simply clamps to the top of the windshield to help deflect or direct air and rain into and away from the cockpit. Instead of buying a new windshield to help this may be a new less costly option to help cool you down or knock down the wind buffeting. Available in Scratch Resistant defletors (Dark Tint, Light Tint, and Clear). Hardware only available in black powder coat.